The centre of gravity of a suspended weight can be considered to be acting at the point of suspension. 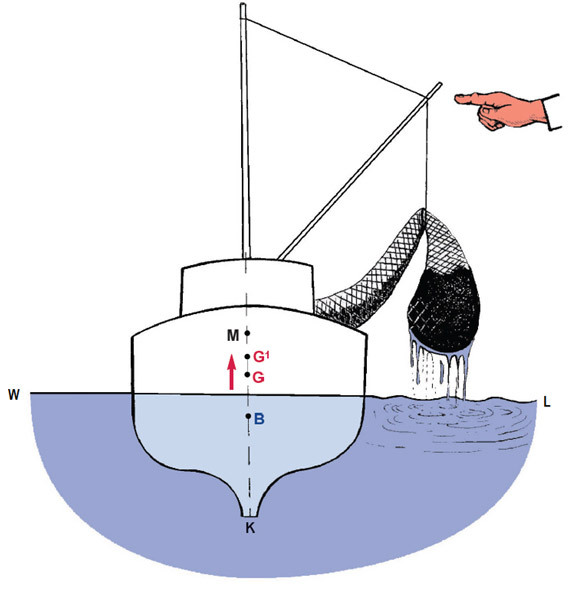 Therefore, a net lifted clear of the water has the same effect on the vessel’s centre of gravity (G) as if the net were actually at the head of the boom. This weight can also exert a heeling force upon the vessel and may, under unfavourable circumstances, capsize the vessel. When a vessel with full tanks is heeled, the liquid within the tanks acts like a solid mass. The liquid’s centre of gravity, being the centre of its volume, remains constant and therefore does not cause any change in the vessel’s centre of gravity (G) or its metacentric height (GM). 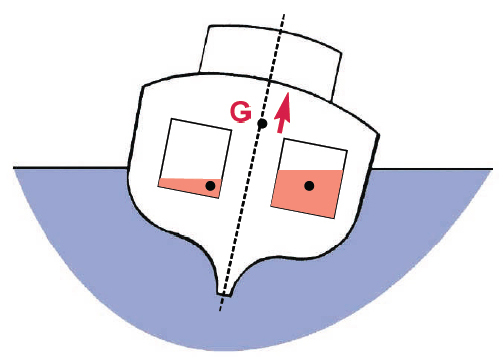 When a vessel with partially-filled tanks is heeled, the liquid will seek to remain in its horizontal position. The centre of gravity of the liquid will move with the liquid. 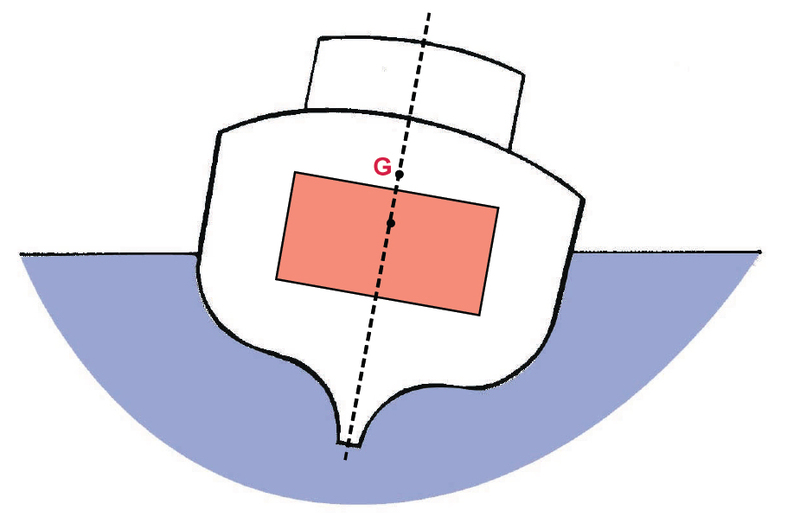 This parallels to a rise of the vessel‘s centre of gravity (G) and a decrease in the vessel’s metacentric height (GM) and thereby its stability. 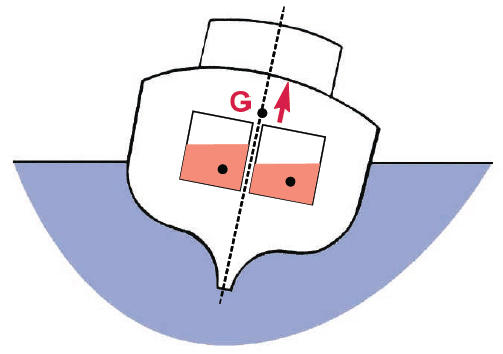 Partially-filled tanks have an adverse effect upon a vessel’s metacentric height (GM). By dividing the tank into two equal parts by the use of a watertight bulkhead the free surface effect on the vessel’s metacentric height (GM) will be reduced by 75% of that of an undivided tank. Care should be taken when endeavouring to correct a list by filling tanks. Having two partially-filled tanks will create additional free surface effect. 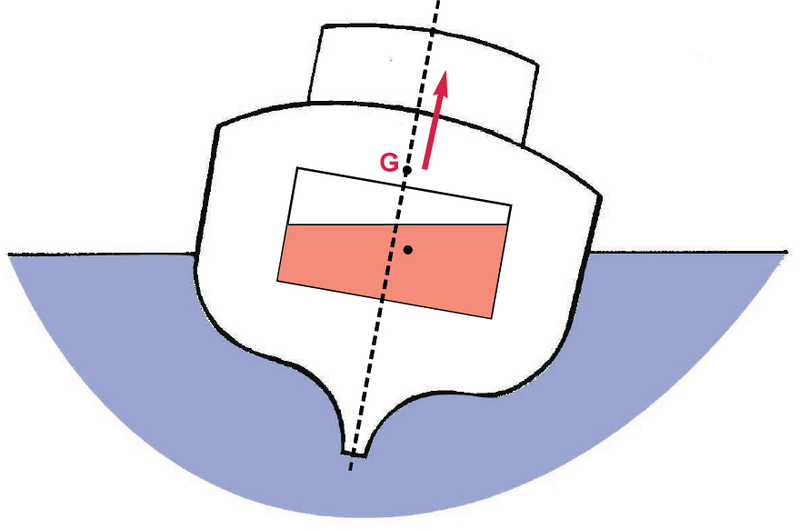 If the vessel’s heel results from loll, it is recommended that the tank on the low side will be filled before commencing to fill the tank on the high side. Free surface effects are not only caused by partially-filled tanks. They can, for example, also be caused by accumulated water on deck. To enable the water to run off quickly, a vessel should have adequate freeing ports. They should always be open and arranged so that water can flow easily to them. Sea which pours into a vessel or between vessel’s compartments reduces her stability. Antiroll tanks have free surface effect and therefore reduce the metacentric height (GM). Antiroll tanks shall therefore always drain if the metacentric height (GM) is low, for example on account of icing. Do not use more oil- and water tanks at the same time than is necessary . Free effect surface does not form in tanks which are either completely full or completely empty. Keep a close watch on the water in the vessel and pump regularly out of the bilge.